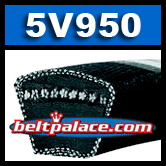 5V950 V-Belt | Narrow Wedge Wrapped cross section 5V950 V-Belt. Home > Heavy Duty V Belts > Power Ace 5V-8V Section Industrial V-Belts > 5V950 Narrow 5V Section V-Belt. 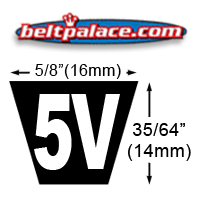 5V950 V-Belt. Wrapped Narrow 5V Section. BTQ 5V950.